We are VERY excited to announce our latest collaboration for 2011. International 'Jellymongers' Bompas & Parr are bringing their eccentric skills to Melbourne next year as part of the Melbourne Food & Wine Festival. We have organised an exclusive 'one night only' event in The Gershwin Room at the famous Espy Hotel in St.Kilda. The event is being named 'ARCHITEXTURAL' and pairs the extravagant architectural jelly making skills of Bompas & Parr with the multi textured cuisine of Burch & Purchese. If you don't know much about the 'Jellymongers' then check out their excellent website www.jellymongers.co.uk and view some of the amazing events they have worked on in the last couple of years. 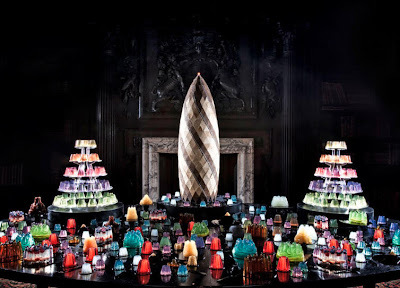 These have included an artisanal chewing gum factory in a shopping centre, a walk in cocktail of vaporised gin & tonic, a Futuristic Aerobanquet and a 'sugar cave' for London Fashion Week. The night at the Espy promises to be a fantastic match between two creative forces and will include drinks, laughs, jellies, music and BIG SURPRISES! We can't tell you too much as we don't want to spoil the night but we can tell you that famous & iconic Melbourne structures may be recreated out of jelly and that Burch & Purchese will provide some specially designed sweet dishes throughout the night. Music & entertainment is on the cards as are special guest MC's and exclusive goodies to take home. Tickets are now available, and if you want to be part of this unique and entertaining night which is sure to be a highlight of the Melbourne Food & Wine Festival 2011, you should email cath@burchandpurchese.com for more details. We hope you decide to join us on the 10th March 2011 and we will update you on announcements on this and other events here as they happen. Thanks Rachel!! Wish you could come too!! My Sweet Studio is a multi sensory retail space that specializes in sweet creations perfect for spontaneous indulgent moments through to that very special dessert extravaganza. Formerly from the UK I now call Australia home and I have built a reputation worldwide for my dessert wizardry; I fuse science with sweetness to create an exciting array of delicious tastes and textures. Walking into Sweet Studio is unlike anywhere else you've been, a place where you can always expected the unexpected. You may find edible bubbles, a chocolate flower garden, a half chocolate and half jam spread, exaggerated raspberries or rich smoked chocolate, not to mention a magnificent selection of seasonal individual desserts or larger cakes all designed to take home for that special night in. Bespoke celebration cakes are another special feature of Sweet Studio. A dedicated consultation area has been created with a unique and interactive flavour wall. Over 300 ingredients are on display to help you design your very own special cake creation. This blog is centred around all things sweet although I may delve into the savoury side of the kitchen from time to time. The edges of these two sides of the kitchen are blurred more than ever before which presents an exciting new world of discovery. We will look at methods and techniques, old and new, recipes and news and events and I welcome your feedback greatly. Thank you for reading and I look forward to welcoming you into my sweet world. Darren Purchese 2012. Simple theme. Powered by Blogger.